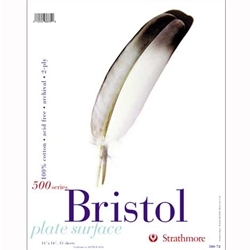 Strathmore 500 Series Bristol Pad - 100% Cotton Vellum (Cold Press) & Plate (Hot Press) Surface - These pads are made with Strathmore 500 series paper, which is Strathmore's premium grade paper. It is 100% cotton, acid free, archival paper. The vellum surface has a toothy finish that is excellent for pencil, charcoal, pastel and oil pastel, as well as pen, airbrush, and light washes. The plate surface has an ultra-smooth finish that is unsurpassed for detailed work with technical pen, airbrush and marker. These bristol pads are 2-ply and are the industry standard. The pads are wire bound across the top. Not recommended for traditional watercolor techniques.